Mutants and Death Ray Guns has made me aware of the scarcity of mutated Plant models, so I figured I's contribute to their numbers. They look really cool, lots of nice details on both! Sketched out the back art today. Hmmm . . . perfect for Mutants and Death Ray Guns! The one on the left even has explosive fruit !! There is a third on the way. It looks a bit like the love child of the other two. More mobile looking and more vines. Damn. What a balanced and dynamic composition/pose ! How do you do that ? If you could compare plants with robots, I would dare to say, those are beating even your Cyclops ! But of course, this comparison is not fair. This is the next miniature project I intend on tackling and finishing. I should have black and white miniatures for both of these ready for the coloring book thread in the next week., The basic art is done, it just needs to be converted over into miniature form. These remind me of Labrat's Choker Roots. So they are intelligent? Throw explosive fruit? The smaller one you talked about could have a lot of good uses in both RPG and wargaming play. In either case, they have a large host tree-creature. 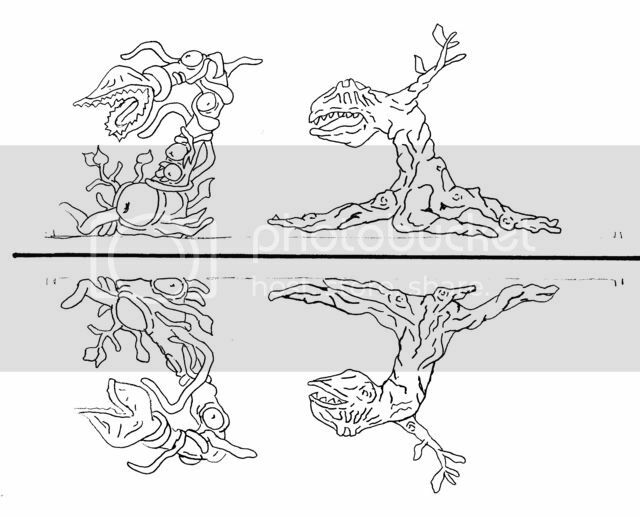 Roll a die, and that many roots appear within 3" of the creature each round. On turns they don't attack, they can move 1" in any direction. Keep in mind, when the tree activates, the first thing it does is generate more roots until destroyed. I may not plunge into full Game Design, but I've been Game Mastering since I was 11. Always interested in new ideas to spring on my players. Added the 1st plant model to the 1st post and to the coloring book thread. This baby is ripe for coloring. Still on the top of my list, Adam.